Yes, it's cold here. Yesterday's ten below was a dry cold, so it was not too bad. Cross-country skiing is the way to go under these circumstances. The back country is in great shape, and track skiing at Mount Van Hoevenberg is simply superb. The conditions are quite fast with chilly down hills, but you can get in a good hour-long workout before you freeze to death. This morning it was 17 below AND it is a damp cold. It feels much more frigid. Which brings me to things to do in the Adirondacks when it's cold. 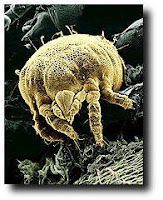 Like Maggie in my favorite episode of "Northern Exposure", I have a dust mite obsession. As a result of years of allergy research, I know far too much about what they are, what they do and how bad they are for allergic people. The scene with a human-size talking mite, with a family to support, chatting with Maggie at the bar, was hilarious, but ugly. The only things that can kill those nasty things is scalding hot water or mean, frigid cold. These bitter cold temperatures present the perfect opportunity for the latter. I put all the big pieces of bedding that cannot be laundered, like feather beds and comforters, in a cold room, one completely unheated. It knocks the mites right out. Just one more reason why I enjoy the cold and love living in the Adirondacks! Surely it is not just the incredible skiing.